Tasks are statements of what people do. This blog post is going to narrow in on how to rate tasks based on Task-to-Duty relationships and applying a numerical rating system. Application: Tasks are at the heart of most behaviorally-based systematic approach models. These models are used extensively by government agencies and the power producing industries. Once the decision has been made in the Analysis Process that training is a viable solution to a performance problem (or future performance need), it’s all about determining the relevant task, and then deciding which tasks to train on. In a job analysis process investigative techniques are utilized to determine what tasks are completed in the performance of a duty. 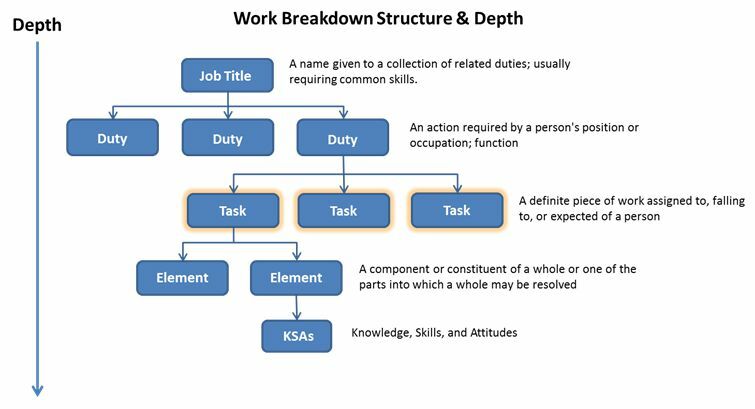 Refer to graphic below for a typical work breakdown structure. The task statement is considered the single most important element of the task analysis process because it provides a standardized, concise format to describe worker actions. One of the classic methods for an objective base decision process to determine what tasks to train on is using numerical averaging criteria. This process has subject matter experts (the more the merrier) rate tasks in relationship to its corresponding duty. The average rating of the task is applied to established criteria. Depending on its rating, a task may: not be trained on, trained on, or trained on and require periodic retraining. See the graphic below for a typical process. Not all tasks were created equal. Tasks have varied relationships to its duty and each relationship has a relative affiliation to its duty that can be defined and quantified. For example how “important” are the consequences if the task was performed incorrectly; it may not really matter or it may be catastrophic. Following is an example of a rating scale for the importance of a task. Note: There is a numerical value assigned to each level. For example: Serious = 3. 1 = NEGLIGIBLE—Improper task performance does not result in exposure to a hazard nor does it make any difference in plant operation (no lost production). Neither does it pose any personnel or environmental safety consequences. 2 = UNDESIRABLE—Improper task performance may result in hazards exposure or cause some undesirable consequences to plant operation (reduced production capability or some potential environmental impact). 3 = SERIOUS—Improper task performance may result in exceeding plant or equipment operating limits, which may require moderate corrective action. 4 = SEVERE—Improper task performance may result in equipment damage or personnel injury requiring extensive corrective action. The nature of the duty will dictate which relationships are relevant. You can use the relationships on a Spider Map I created to help guide you. In addition, here is a list of NumericalRating Scales you can use for the relationships on the Spider Map. These scales are meant to be a starting point and probably will and should be modified to your specific needs. Consider this my permission to use them freely. Setting the criteria requires reasoned judgment and integration of the rating values. For example: A task that is rated high in “difficulty” and performed “frequently” may be designate for initial training but not included in periodic refresher training. The criterion may be relatively simple; all tasks with a “safety hazard severity” rating of 3 or greater will be included in the training intervention. The more relationships used in the decision process, the more complicated the decision process. For an example see a Decision Tree used by the Department of Energy (1). You just have to find what works for you. Tasks are at the heart of most behaviorally-based systematic approach models. I hope you find it a little easier to apply an objective – numerical rating system if and when the need arises.